Epic has provided various services and offers expertise based on proven experience and practical knowledge. Understanding the needs of our clients and developing a technical approach to best serve both the short and longer term business interests of our clients is our primary focus. Key Epic personnel are OSHA, First Aid, CPR, H2S Alive, WHMIS, TDG and Ground Disturbance trained. All on-site persons are equipped with the latest in Personal Protection Equipment, including personnel safety gas monitors. The vehicles used by Epic are equipped with cellular phones, 20lb ABC fire extinguishers and first aid supplies. Work safety is a primary focus of Epic with a history of no on-site incidents during it’s existence. The following provides details of some of the services provided by Epic. negotiation and acquisition of landowner release on abandonment property. Part of the required oil and gas well abandonment process in Saskatchewan is the testing for potential gas migration around wellheads prior to the cut and capping process. Epic is trained and equipped to provide prompt, accurate and cost effective assessments, along with detailed reporting to the Saskatchewan Industry and Resources. Epic can assess and supervise in the decommissioning of old flarepits. In the past Epic staff has successfully assisted in abandoning flare pits varying from a few hundred to several thousand metric tonnes of hydrocarbon and salt contaminated soils. 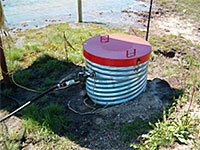 Remediating contaminated flare pits by landfarming has proven cost effective on operating battery sites. Epic has experience in designing and supervising the construction and management of these landfarms and leachate collection systems. Supervision of excavation and haulage of contaminated material to a licensed disposal facility is another widely chosen option. One of Epic's expertise involves the assessment and remedial supervision of salt and oil spills. Professional soil sampling and “initial response” handling services gives accurate analytical assessment of spill sites. 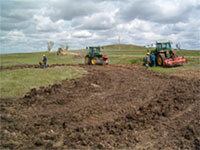 Reclamation plans and supervision of the projects can then be provided. 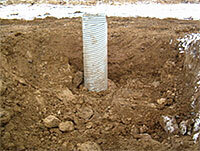 Various soil amendments and spill clean up products are kept in stock. Epic provides on-site drilling, fluid and cuttings sampling and analysis. Epic technicians are equipped and trained for accurate sampling and analysis as per government requirements. The addition of hydrocarbon test kits provides companies with accurate and prompt analysis so disposal options can be assessed in a more timely fashion. Epic supplies experienced professional technical service to analyze and supervise various drilling waste disposal methods including on and off-site disposal and landspreading while drilling (LWD). Landspreading while drilling of spent drilling fluids has proven a convenient method of disposal in sensitive and other areas where pits are not wanted or allowed. 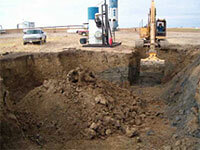 LWD allows a quick clean up of an oil or gas well site eliminating the "open pit" problems. The testing of domestic water wells is a service provided by Epic staff. Aquifer drawdown and recharge provides valuable information to assess potential impact from seismic and oil & gas drilling operations. On-site water sampling and proper packaging for laboratory analysis gives clients accurate results for later reference if required. 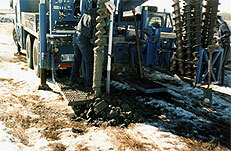 Cost effective pre and post drilling site assessments are provided to clients by Epic staff. These assessments give a detailed preliminary soil, plant type and heritage resource view of the site prior to and after the site is developed. Field technicians are also familiar with the operation of the oil and gas field equipment, so both environmental and safety issues can be addressed in the assessments. 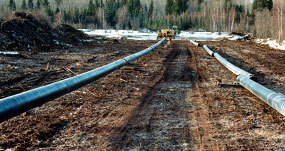 Phase I and II assessments can also be provided on existing Oil & Gas and Commercial properties. preparation and submission of Saskatchewan Environment’s required paper work. site assessment and report submission to regulatory agencies. Epic has evolved their services with the introduction of geophysics to address the needs of their clients. EM Surveys are a proven way to characterize soils and delineate contamination plumes, while still being a non-invasive/non-destructive sampling method. EM Survey applications include poor growth assessments, historic and recent spill sites, plume tracking, pre-drill site assessments, and final site abandonment. We offer the EM38 geophysical instrument which has an effective sensing depth of approximately 1.5 meters. Our equipment can be either hand held for close quarters or more commonly, attached to a four wheel all terrain vehicle (ATV) to cover larger areas. A differential global positioning system (DGPS) provides high location accuracy with each EM reading. Highly detailed geophysical maps are produced by specialized software and the collected sampling data. Our reporting methods are straightforward and the EM maps make it easy to visualize subsoil conditions. The benefits from EM surveys are vast and are an extremely cost effective aid for environmental problem solving. Monitoring wells have proven to be valuable assessment tools for the oil and gas industry to assess groundwater impact from contaminated sites. Epic provides professional experience for monitor well installation, sampling and analysis requirements. © Copyright Epic Environmental Technologies Inc. - Saskatchewan, Canada.